National Law Enforcement Appreciation Day was last week, January 9, and both chain-based and independent restaurants were showcased on social media for their support for the guys and gals who don a badge and hit the streets. Despite mainstream media contrarians, there are plenty of eateries which openly exhibit support for police personnel, and they all deserve in-kind kudos. Wherever you may be, family-owned pizzerias bring pizza pies to police HQs to convey gratitude to police dispatchers who are the first line of defense, the first voice one hears when the floor is dropping out. After responding to calls on midnight shift, I’d double-back and help the dispatchers…clean up. Sometimes a collection of unrelated area restaurants get together in charitable causes to aggregate dollars for donation to police officer funds determined to help surviving loved ones when their cop becomes a duty-related fatality, as had been the case in Baton Rouge, Louisiana in July 2016. Making national headlines, several Baton Rouge-area law enforcement officers were ambushed and felled by gunfire. An assortment of local independent restaurants whipped up plans to dedicate 25 percent of all respective meal proceeds, to be donated to the Baton Rouge Area Foundation Fund and its support of police and first responders. Chick-fil-A’s unwavering devotion to supporting police comes to mind. That chain is closed on Sundays but its doors are always otherwise open for cops. And some Chick-fil-A locations even open up on their day off, when management learns a massive event being investigated by hordes of police personnel means many public safety bellies go empty and must be fed. Heck, even a little girl at her favorite restaurant in San Antonio observed a table loaded with cops breaking bread, so she went over and asked if she could pray for them. Of course, they obliged, blended hands, and bowed their heads. Sadly, this gracious moment spontaneously held in a restaurant feeding cops followed the feels of a recent line-of-duty murder of a San Antonio policeman. That experience will make anyone there that day, at that moment, remember that restaurant forever. The Up North Lodge welcomes police officers and even has a “Cops eat free day” on the second Tuesday of every month. This is only one example of many just like it. My beat when I was on patrol had tons of mom-and-pop shops dishing out delicious foodstuffs on special days for coppers. Agency policy dictates were a thorn (no special favors), so to make it an amicable honor, I still paid for my meals (read sizable tips in the servers’ pockets). A Red Robin restaurant in Columbus, Ohio had a widespread viral exposure when one of its servers, a daughter of a retired cop, saw nine police officers enter her restaurant and sit in her section. Turns out they just buried a fallen comrade, and she seemed to recognize their somber expressions and body language telegraphing burden. Cops sought comfort and a meal, and Red Robin delivered both and more. Cops protecting and serving has different meanings in some parts. Red Robin has a tip-a-cop program whereby police officers in uniform agree to serve restaurant patrons and furnish all their tips toward the Special Olympics fund. I bet zero salt-and-pepper shakers went missing and folks ordered more soda pop instead of beer. Whereas Red Robin has cops waiting tables, Texas Roadhouse in Dallas, however, goes as far as reserving a table for five cops. Not just the first five cops to arrive but five particular law enforcement officers who they knew would never show. Mad props. Deep respect. The Texas Roadhouse management who set aside a specific table for five surely took a grand leap of faith that all others, especially their paying patrons who were seeking seats, would understand and embrace the gesture. 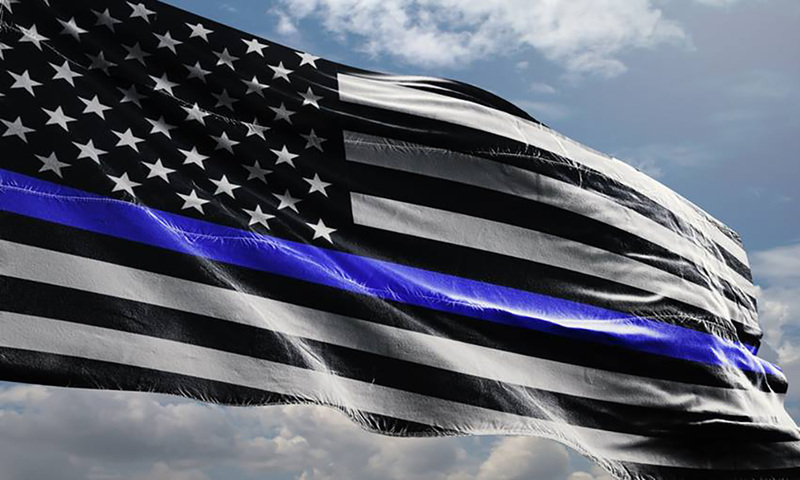 And this was not done on National Law Enforcement Appreciation Day either; it was situated on an entirely different day symbolizing particular police recognition. The table reserved for five was adorned with white linen tablecloth, five place settings with spotless drinking glasses, and five sets of pristine eating utensils enveloped by black linens, all in front of the backdrop which comprised one United States flag next to one Texas state flag. And this has become a tradition for Texas Roadhouse restaurants in Texas; the Flower Mound location catered the same honor in July 2016, mere days after the Dallas ambush which spawned the restaurant reserving the honor for five fallen comrades whose end-of-watch was on the same day and in the same city. You just watched as a phalanx of Dallas police officers took cover from varying positions where sniper-fire emanated. Take note of cops corralling members of the public and guiding them to safety; some of those cops don yellow uniform shirts, enhancing them as targets. That latter observation is not an indictment but a factor in what likely made the cretins’ aims easier. Also take note how Dallas cops unambivalently entered the kill zone to body-blanket then drag their fallen brothers from the unrelenting fusillade showering down upon a chaotic cityscape. Although I’ve never had to body-drag a brother/sister cop from such a grotesque scene (only the dummy during police academy physical training), I grieve all the same. And that circles back to the heart of the subject matter, namely Texas Roadhouse’s grand expression of indebtedness. I’ve no idea what their revenues are since or before their wholly supportive gesture conveying grand-slam respect and posthumous tribute, but I know what my next beef-eating agenda entails. I’ve never been to a Texas Roadhouse restaurant, but that’s about to change. According to FaithIt.com, “The [Texas Roadhouse] restaurant also donated ten percent of its sales [upon every July 7 commemoration] to the Assist the Officer Foundation, which is run by the Dallas Police Association.” Yeah, I’ve decided.